So, we have already plunged into the study of paper deep enough. We figured out which types of paper are the most suitable for different types of painting and drawing, considered less and more dense paper designed for packaging, postcards and covers. Now it is time to talk about a large and voluminous section of paper for printing. Printing production includes a lot of different printed publications, each of which is created on the relevant, i.e. suitable paper for the type and purpose. There are "basic" prototypes, on the basis of which all other subspecies are created. It is intended for printing on a blanket machine or risograph. Its distinctive feature is high content of wood pulp (pulp) and reduced level of hygroscopicity, which provides excellent resistance to various types of mechanical damage (strength is much higher than that of other types). What distinguishes it from other types? First, it must be glued, it allows to resist the action of water. In addition, well-glued paper is less dusty. 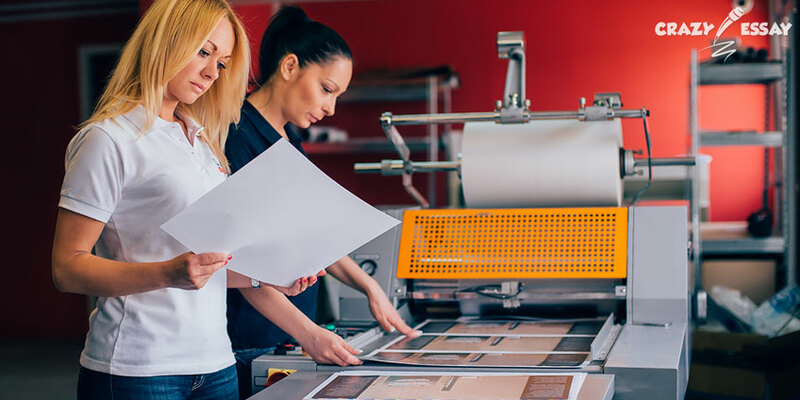 It is known that dust settles on rubber-fabric sheets and worsens quality of a print, clogs an apparatus, reduces printability of a printed form. In offset printing, the printed matter is in contact with water at the time of printing. In this case, the surface need not have an extremely flat side. It is because the image in offset printing is transferred to sheets through a rubber tympanum, which compensates for any irregularities. This paper is characterized by a whiteness ratio of 60%, which allows printing text blocks, black and white and color illustrations, tables on it without loss of image quality. We have already talked about it, discussing paper for artists. Its parameters are characterized by high quality. Sheets are made of base paper with a high content of cellulose: a pigmented glue paste is applied to the top layer, which hides all. The result is a high-quality paper with a whiteness level of 70% and a smooth surface, the texture of which can be matte or glossy. The density of coated paper depends on the technology of its production. There is a one-time and two-fold coating. Coated double-sided paper is widely used in printing houses for the production of representative and promotional printed products: leaflets, brochures, glossy magazines, greeting cards. High-quality illustrations are printed on coated paper, in particular, various magazines, catalogs, business cards. Glossy images are bright, but you should choose matte ones for books and catalogs. It tears eyes to a lesser degree. Paper should be sufficiently smooth and deform during the printing process. After all, here an image is not transmitted through flexible material. Too high resistance of paper to water is not important here because water does not come into contact with the material being sealed. Although this type of printing is rarely used now, we should also consider it. In particular, it should have the smoothest surface. The final quality depends on the quality of paper. It is used to print maps. It should have increased high mechanical strength. After all, maps are repeatedly bent and operated in conditions far from ideal. In addition, material should not contain blockages and clogs, because they can be mistaken for an object on a map. As is clear from the title, this paper is intended for printing newspapers. Since high-speed printing machines are used in this production, the paint is also special. In addition, newspapers should be promptly provided to users, and there is no time for them to dry out. Therefore, newsprint paper has an increased porosity. When printing, the paint gets into these pores like a sponge. If you rub a freshly printed newspaper well, you can dirty your hands – the paint has not dried yet. This kind of paper is used to make a flyleaf (this is a sheet that holds the cover of the book with its block). Not all firms producing books understand that usual offset paper is not suitable for flyleaf. After all, endpaper has increased strength to resist bending, in addition, the fold is very well glued, because a flyleaf is attached to a book block and a cover with glue. This is a special material, the upper layer of which is covered with a metallized coating. For the most part, it is used for labels and business cards. Since the surface of this paper does not absorb paint at all, then it should be printed with special paints, which are fixed not by absorption. Folic paints are used for printing on non-absorbent surfaces. It is better to print on offset machines with alcohol moisturizers, which allow to precisely regulate the supply of humidification. It is designed for printing labels. The main difference from ordinary paper is the presence of a "face" and an underside. The front side has a smooth surface (to look beautiful), and the reverse is rough (so that a label is well attached to a bottle). There is a story that at one time, because of ignorance of these nuances, the label was printed on coated paper and, naturally, it did not attach to the bottle. The technologist was fired. Special high-quality paper is made of cellulose. Its distinctive feature is that it is resistant to repeated bending and mechanical damage. It often contains a "watermark" – a hidden image that can be seen when looking at light. Each state keeps the composition under hat, because this is one of the stages of protection. There was a case when counterfeiters forged English pounds sterling. And fakes were recognized only by the composition of fiber. It turns out that for the manufacture of English currency, cotton is used which is grown on a special site somewhere in India. We examined the main types of paper. Now we are relatively well oriented in this topic, but there are still certain nuances which we can talk about. We will do this in the following article. Rated 4.5 | 67 votes.